The Market Square Historic District is the heart and soul of Downtown, even making its way to the National Register of Historic Places in 1983. 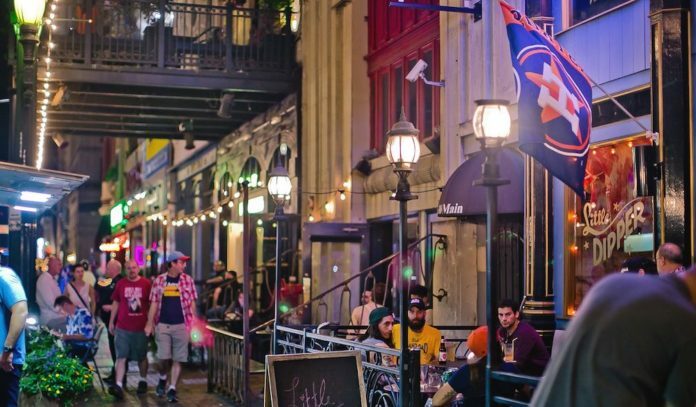 Anchored by Market Square Park, the area hosts some of the oldest buildings in the city, as well as a plethora of bars, restaurants, and entertainment within walking distance. For the purposes of this list, the Market Square Historic District runs from Texas to Commerce and Louisiana to Main. Market Square Park – Bound by Travis, Milam, Congress and Preston, Market Square Park is the original heart of the city, once used as an open-air market and home to several City Halls. Today, you’ll find the park offering a mix of shaded walkways and tables, Greek-inspired eats from Niko Niko’s, dog runs, and entertainment. Check out the calendar for a lineup of upcoming events, from movie screenings and Blanket Bingo to bike meetups, workout classes, and festivals. Houston is Inspired mural – See why Houston is “inspired, hip, tasty, funky, savvy” by popping by this vibrant mural from local graffiti master Gonzo247, artist and founder of Houston’s Aerosol Warfare Studio. Featuring bright colors and the Houston skyline, the inspired artwork is located on the corner of Travis and Preston. Prohibition Theater – Home to burlesque troupe The Moonlight Dolls, this stunning theater rocks Art Deco features, a serpentine staircase, semi-private mezzanine, and grand stage for sultry performances. You’ll find it off Prairie and Main. Nearby Theater District – Nearby in the area around and bounded by Preston, Bagby, Walker, and Milam Streets, one of Houston’s crown jewels is its majestic Theater District, where you’ll find a mosaic of artistic performance venues, as well as bars, restaurants, and family-friendly attractions that are all just a stone’s throw away. Barnaby’s at Market Square – The Market Square outpost of this favorite local cafe offers breakfast and lunch Monday through Saturday. Get pancake stacks, burgers, salads and more. Batanga – This sultry restaurant rocks Latin tapas, mojitos and sangria, and brunch. Hit the string light-adorned patio on nicer days. La Carafe – Believed to be the oldest bar in Houston, La Carafe sits off Market Square Park, boasting a nice wine selection, cozy atmosphere, and mellow vibe. Char Bar – Also off the park, this unique spot has been operating since 1930, bringing both an in-house tailor and full-service bar. Coterie – Set in the luxurious Market Square Tower, this all-day café and wine bar is the perfect retreat. Linger over wines and lattes while noshing on brioche cinnamon rolls, Wagyu burgers, and cacio e pepe pizzas. Hearsay Market Square – Go back in time at this chic Market Square gastro-lounge, which boasts a stunning chandelier, handsome bar, exposed brick, and second-story terrace. Hit it to nosh on mushroom-crusted N.Y. strip, Ahi tuna tacos, prime rib French dip, and a killer brunch. La Fisheria – Off Milam, this vibrant hotspot is known for its Mexican seafood, from shrimp tamales and tuna tostadas to five styles of ceviche. Kanaloa – Houston’s tiki scene gained another winner in this Market Square Park tiki and rum bar. Niko Niko’s – Set right in Market Square Park, this Greek food stand slings gyros, kebabs, burgers and more. Treebeards on Market Square – Gumbo, shrimp etouffee, and chicken-fried chicken specials are all on the menu at this weekday lunch favorite. Warren’s Inn – Right outside of Market Square Park on Travis, this old school dive is a Downtown classic. Cultivated F+B – Dine on Ahi tuna tartar, short rib tacos, filet mignon au poivre, and chocolate ganache cake at this elegant Hotel Lancaster spot. Pad Thai – Tom yum gaai, pad thai, crispy duck, and yellow, red, and green curries are all on the menu at this Louisiana haunt. OKRA Charity Saloon – Drink for a cause at this popular bar, which donates all of its proceeds to a local charity each month (each drink will earn you a charitable vote). The hotspot sits just off Main on Congress. Boomtown Coffee – This fan-favorite coffee shop now has an outpost on Main, offering breakfast, lunch, and expertly crafted lattes, teas, and cocktails. Bravery Chef Hall – Set in Aris Market Square, this fresh-faced food hall is set to offer chef-driven concepts from Ben McPherson’s BOH Pasta to David Guerrero’s coast Latin spot, Nuna. Frank’s Pizza and Frank’s Backyard – Grab a slice at this fan-favorite pizza joint, then hit the next door Frank’s Backyard for beers, wines, and spirits. Or better yet, order a whole pie and enjoy it at the bar. El Big Bad – This margarita bar and kitchen infuses its tequila in house, with flavors from basil and chili to marshmallow, papaya, and pistachio. Sip margs and tequilas alongside chips and queso, cochinita tacos, and hangover enchiladas. Little Dipper Bar – Sip bourbon and check out the jukebox at this cool Main Street bar. Captain Foxheart’s Bad News Bar & Spirit Lodge – This second-story haunt is a bit hidden; you’ll find the doorway off Main and a creaky staircase that leads up to the cozy craft cocktail bar and patio. Cantina Barba – This taco-fueled joint off Main is open from morning till late night, slinging goodies stuffed with chorizo and eggs, smoked pork, barbacoa and more. The Pastry War – One of Downtown’s coolest spots is this Main Street mezcaleria, from the minds behind the ever-popular Anvil in Montrose. Tongue-Cut Sparrow – Accessible through a door and stairwell inside The Pastry War, this high-class drinkery offers a formal cocktail bar experience. Reservations can be made for half the bar, with the other half reserved for walk-ins. Nightingale Room – A sibling establishment to spots like The Pastry War and Anvil Bar & Refuge, this small nightclub and bar offers fresh drinks and an enormous collection of vinyl, plus house music on the weekends. Casa Blanca Lounge – This Main Street hideaway turns up the volume with music and flowing drinks by night. Notsuoh – Part bar, part eclectic music, art and poetry space, this oddball dive is Houston at its finest. Dean’s – Grab an Old Fashioned or a local brew at this casually cool cocktailery, located off Main. Public Services Wine & Whisky – Located in the historic Houston Cotton Exchange Building on Travis, this classy bar specializes in an international selection of hard to find wines and whiskeys. Craft Beer Cellar – On the corner of Franklin and Travis, head here to shop for a wide selection of brews, wines, and ciders, or hit the bar for the same. Wokker – This food truck turned brick-and-mortar serves up fusion eats inside Craft Beer Cellar. Get garlic noodles, Akaushi burgers, Cajun hush puppies, and brisket pad Thai. Houston Watch Company – Across from the Bayou Lofts on Franklin, this throwback bar serves old-fashioned drinks the modern way. Thai Café – Head to this quaint café on Franklin and Main to fill up on specialties like pad thai, fiery curries, and mango sweet rice. Hotel ICON – Enjoy a leisurely meal at Line & Lariat or get a drink at the L&L Bar at this iconic hotel, set right around the corner from Market Square Park. Roma’s Pizza – Grab a slice or a whole pie at this Main Street pizza joint. Fabian’s Latin Flavors – This Main Street spot whips up eclectic Latin flavors, from empanadas and ceviche to Cuban mojo ribs. Look out for salsa nights with live DJs and dancing. Caffé Di Firenze – Head to this Prairie coffee shop for Italian coffees, pastries, and panini. Local Foods – With seasonal treats and locally-sourced ingredients, this casual kitchen offers next-level sandwiches, refreshing salads and more. The nut-crumbled “crunchy” chicken sandwich is a local favorite. The Commoner & The Boulevardier – Get simple, straightforward cocktails daily at the downstairs The Commoner, and a comfy escape from the city at upstairs lounge The Boulevardier on Thursday through Saturdays. Bovine & Barley – It’s all about craft beer and good nosh at this fun hangout. Hit the taps and casks and grub on eats from wings and brisket nachos to burgers and fried eclairs. Lawless Kitchen & Spirits – This glitzy and elegant haunt in the Rice Hotel offers plush lounge seating, a handsome bar, a stiff Rye Manhattan, and views of the city. Sambuca – On the corner of Texas and Travis, Sambuca features savory new American food, modern cocktails, and live music. Azuma Downtown – Continue along Texas for sushi, sake and Japanese bites and plates at this chic restaurant. Live Sports Bar & Grill – Hit the rooftop at this popular nightlife spot, or hang out inside and catch the games on TV. Boots ‘n Shoots – You’ll have a whiskey-soaked good time at this Main Street party spot. Conservatory – Houston’s first food hall is just off Prairie, featuring an underground beer garden, wine bar, and vendors from Arte Pizzeria to Moku Bar. The Moonshiner’s Southern Table + Bar – From house moonshine and smoked brisket grilled cheese to craft beers and shrimp & grits, this kitchen and bar offers a taste of Southern comfort. Molly’s Pub – Grab a pint at this toasty Irish watering hole on Main. Shay McElroy’s Irish Pub With lush furnishings from the Rice Hotel and a bar imported from Ireland, this pub lends itself to both a quiet afternoon drink and rowdy night. Minuti Coffee – Get your morning, afternoon or a nighttime pick-me-up at this Italian coffeehouse, located on Texas and Main.